Barnard Castle is a fascinating 12th century castle steeped in diverse history and surrounded by a town of the same name that also features plenty of additional sites worth seeing. The settlement is known as the leading market town in the valley of Teesdale, with an abundance of shopping opportunities and several historic attractions. Designated as a Grade I English Heritage Building and a Scheduled Ancient Monument, the site is open to the public and is well maintained. The primary attractions are the original 12th century tower and the Great Hall and Great Chamber added in the 14th century. The construction of Barnard Castle began in the 11th and 12th centuries. The project was built on the foundations of a previous Anglo-Norse estate and spearheaded by Guy de Balliol from 1095-1125. Later on his nephew and son – Bernard de Balliol and Bernard II – added to the castle between 1125-1185. Then in 1216 Alexander II, King of Scotland besieged the estate, after which it was given to the Bishop of Durham in 1296. Several years later, Edward I granted the estate to the Earl of Warwick in 1300. The castle was then passed into the Neville family by marriage in the 15th century. Although it was briefly controlled by the Duke of Gloucester in 1477, the Neville’s went on to possess and significantly improve the castle during the 16th and 17th centuries. With the property passing through so many owners and eras, it’s easy to see how one could spend a whole day just learning about the history and culture surrounding the building. 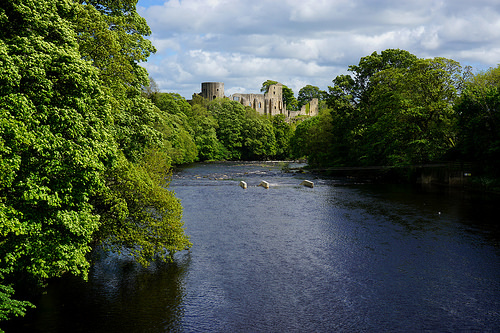 One you get tired of touring the castle grounds, you’ll be happy to find out that there’s plenty to do in the town of Barnard Castle and Teesdale as a whole. To get started, you should head over to the Bowlees Visitor Centre to become acquainted with the area’s best spots and to relax in the surprisingly beautiful outdoor environment which includes a picturesque waterfall. You’ll definitely want to see Bowes Museum, a French Chateaux style building that houses the most extensive collection of fine art in the North of England. The Eggleston Hall Gardens and Egglestone Abbey are other sites to add to your itinerary, as are Bowes Castle, Raby Castle, Rokeby Park, and the Teesdale Alpaca Park. As a market town, Barnard Castle has a longstanding history of hosting all sorts of shops, and this tradition is continued today with a bustling High Street that’s home to a decent selection of independent boutiques. There are also several antique shops that reliably attract crowds of buyers and collectors from all over the world. Of course, you’ll find a handful of specialty shops selling gifts and memorabilia in case you’re looking for something to help commemorate your stay. After you’ve worked up an appetite, take a quick stroll through the centre of town along the A67 Galgate to choose from at least a dozen dining establishments.